Metta Refuge Dharma Nuggets: Pema Chodron - Don't practice Idiot Compassion! 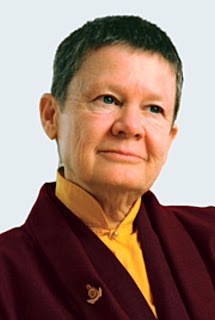 Pema Chodron - Don't practice Idiot Compassion! "Don't impose the wrong notion of what harmony is, what compassion is, what patience is, what generosity is. Don't misinterpret what these things really are. There is compassion and there is idiot compassion; there is patience and there is idiot patience; there is generosity and there is idiot generosity. For example, trying to smooth everything out to avoid confrontation, not to rock the boat, is not what's meant by compassion or patience. It's what is meant by control. Then you are not trying to step into unknown territory, to find yourself more naked with less protection and therefore more in contact with reality. Instead, you use the idiot forms of compassion and so forth just to get ground. ...So you sit there and you say, "Okay, now I'm going to make friends with the fact that I am hurting and afraid, and this is really awful." But you are just trying to avoid conflict here; you just don't want to make things worse. Then all the guests are misbehaving; you work hard all day and they just sit around, smoking cigarettes, drinking beer, eating your food, and then beating you up. You think you're being a warrior and a Bodhisattva by doing nothing and saying nothing, but what you're being is a coward. You're just afraid of making the situation worse. Finally they kick you out of your house and you're sitting on the sidewalk. Somebody walks by and says, "What are you doing sitting out here?" You answer, "I am practicing patience and compassion." That's missing the point." 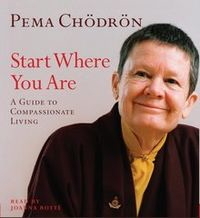 From Start Where You Are : A Guide to Compassionate Living by Pema Chodron, Copyright 1994, Shambhala Publications.